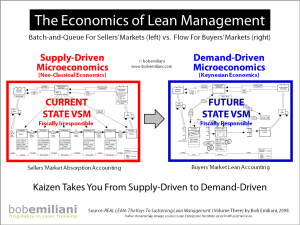 Too often, management’s raison d’être for adopting Lean is to cut operating costs within the framework of their existing economic model: batch-and-queue material and information processing. 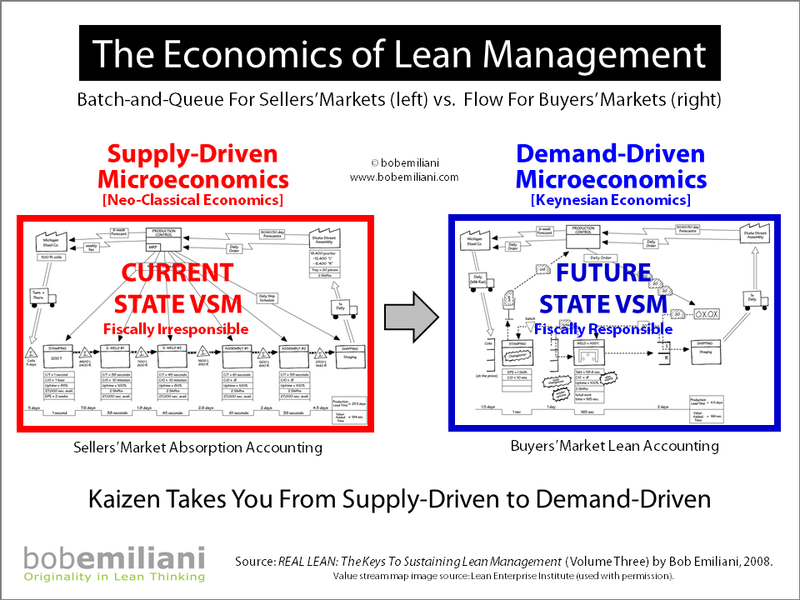 The industry that sells Lean is all too happy to accommodate management’s desire to serve buyers’ markets using batch-and-queue, the method that was designed for sellers’ markets. Do you understand the inconsistency? Taiichi Ohno was very clear on this point: the Toyota Production System, inclusive of The Toyota Way (TPS+TW), was developed to satisfy the needs of individual customers, one by one, because it was no longer possible for companies to make what they wanted in the large qualities they wanted in the hope that customers would buy it. Most markets are competitive, which means buyers’ markets dominate the business landscape, not sellers’ markets. Batch-and-queue material and information processing will only lead to trouble. What Ohno and his team were able to achieve in realizing this vision of a management system made for buyers’ markets – continuous flow – is remarkable. And it is vastly under-appreciated. 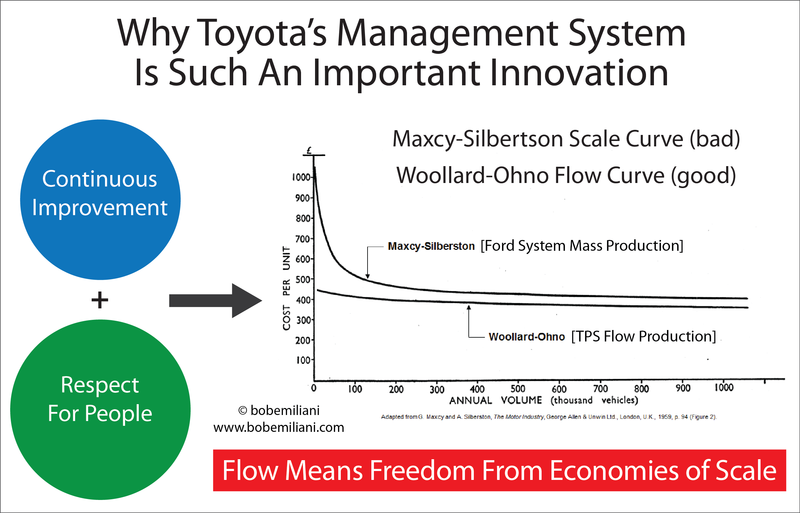 They recognized that TPS+TW changed the economics of production (and related activities upstream and downstream of production) so dramatically that it was the next great achievement following Henry Ford‘s system of mass production. 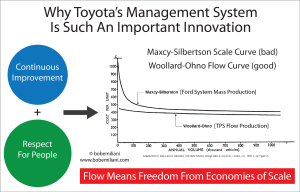 Ohno and his disciples surpassed the Ford system, but few have understood the significance of flow production. While most people think of Lean as a tweak to current batch-and-queue production practices to cut costs short-term, Ohno created a tremendous innovation and he grasped its significance. Flow was a new economic model. Ohno was not just a great production engineer and industrial manager, he was a great economist as well. Yet, there remains a widespread failure by the leaders of the Lean community to understand or articulate the economic benefit of Lean management. Likewise, the leaders of organizations (CEOs and CFOs) remain mostly unaware of the huge economic differences between batch-and-queue compared to flow. Furthermore, they fail to realize that the way to get to that economic benefit lies in the often-ignored “Respect for People” principle. It can be safely said that any organization in the industry that sells Lean which does not vigorously put the “Respect for People” principle at the forefront has completely botched any effort to advance Lean management (TPS+TW). They no longer have to contend with faulty batch-and-queue processing, the daily headaches, and the unsolvable problems that result from it. There is a better way. They no longer have to play inventory games, outsource work overseas, incorporate offshore, or squeeze suppliers. A Lean accounting system finally reflects financial realities that standard cost accounting can never do. It is possible to become much more closely synchronized between demand and production (e.g. ±5 percent vs. ±30 percent or more). The economies of scale thinking learned in school and chased for so many years is long dead. They are now free to think about business in completely new ways. Small volumes can be produced at costs lower than the batch-and-queue mass producers, while offering customers greater variety. They can sell more and grow the business on a much smaller base of assets. Investment decisions can more directly support the growth strategy. Both images show that output driven by actual customer demand is at its lowest cost (and highest quality and shortest lead-time) when material and information flow. Getting to that condition requires leaders who are willing to lead efforts to improve all processes from batch-and-queue to flow. There will be much for them to unlearn and learn on the road to fiscal responsibility and customer satisfaction. But, to gain access to these wonderful benefits, leaders have to understand what kaizen is, and how kaizen is practiced. Too often, people do kairyo – changing things – instead of kaizen – to change things for the better. Changes that do not fundamentally change the economics of the system while concurrently developing people’s capabilities are no good. Business leaders must recognize that not all kaizen is the same. If leaders want to achieve the outcomes shown in the above two images – the result of developing people – then they must carefully distinguish between those in the Lean industry who sell kaizen and those who sell kairyo labeled as kaizen, whether it is in books, videos, or live training courses. Leaders must also understand that to get at these wonderful economic benefits, the “Respect for People” principle must be at the forefront, including an unwavering commitment to never lay anyone off as a result of kaizen. That is how you meet your fiduciary responsibilities, earn profit, and create shareholder value, without screwing your employees, suppliers, customers, and communities – and investors too if you really think about it. I don’t understand what you are saying here. Can you please provide an example or clarify? Here are some examples: Point kaizen. 5S programs. Quality control circles sold as kaizen. Selling Lean as tools for the manager’s toolkit. Lean lite… Lean without material and information flow. See Chapter 5, “Manage to the Market,” in REAL LEAN Volume Two (2007).